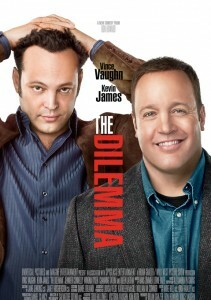 A buddy comedy/drama starring Vince Vaughn as Ronny Valentine and Kevin James as his best friend Nick Brannen, The Dilemma centers around Ronny and his problem. The thing is, Ronny has discovered that his best friend’s wife, Geneva (played by Winona Ryder) is cheating on him with a tattooed-up miscreant, Channing Tatum. So Ronny faces a choice: to tell or not to tell. The usual dilemma is compounded by the fact that the duo is trying to sell a “manly” electric engine prototype to a large car company. While Ronny is the business brains of their venture, Nick is the car genius who is already stressed from trying to make the working prototype to meet a strict deadline. Thus Ronny’s problem becomes even more complicated. If he tells Nick about his cheating wife, he might not finish the engine and then their venture, for which both have staked a lot of money, will be sunk. Vince Vaughn and Kevin James in their roles as best-friends-since-college are believable. Even Jennifer Connelly as Ronny’s girlfriend Beth who sticks by Ronny throughout the issues of the film is convincing. The issue comes from Winona Ryder’s character of Geneva. The acting itself is not the issue; Ryder acts the part well. The issue comes with the script writing. It is a bit difficult to swallow Geneva’s niceties with her heartless discussions with Ronny about her affair. The climax scene especially and the character’s reactions seem a bit strange.